We arrived in Shanghai for a week before we went off to explore the rest of China. Our first hotel was the Westin Bund Shanghai. 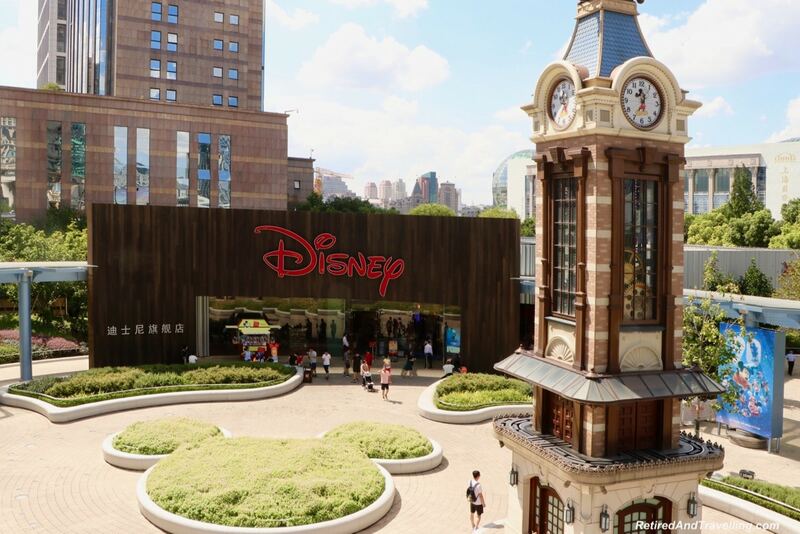 It was located in a great spot for us to experience the Bund River area in Shanghai. The Huangpu River runs though Shanghai. It connects to the Yangtze River which we cruised on this trip. 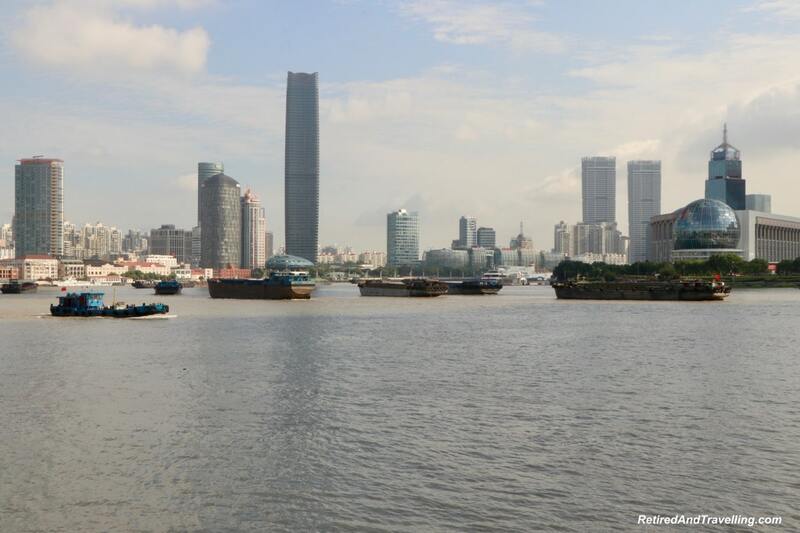 The river bank area is known as the Bund or “muddy bank”. 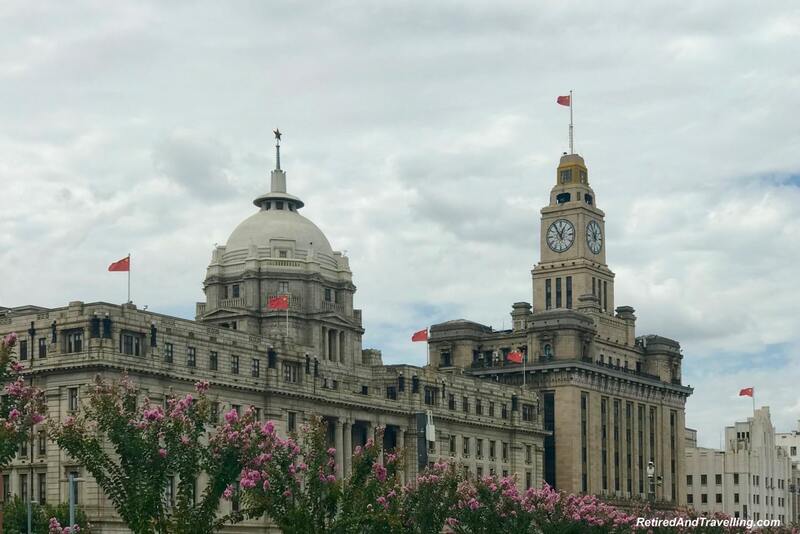 We made many trips day and night to see the sights along the Bund. It was an easy walk from the hotel to experience the Bund River area in Shanghai. 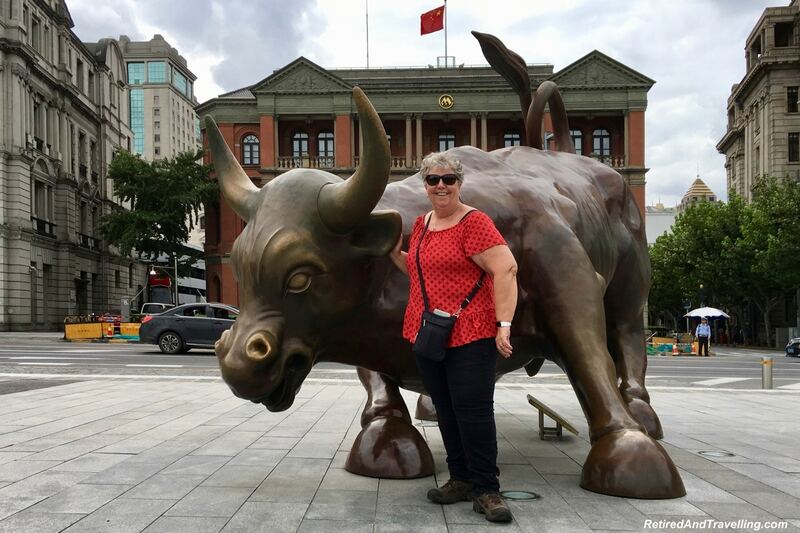 We passed by the Shanghai Bull beside the waterway. It reminded us of the bull on Wall Street in New York City. All along the river on both sides of the Huangpu River we found interesting building architecture. We enjoyed the architecture in old cities like Prague, in more contemporary cities like Chicago and in architectural gems like Dubai! Our first walk down to the Bund area was on a grey day. 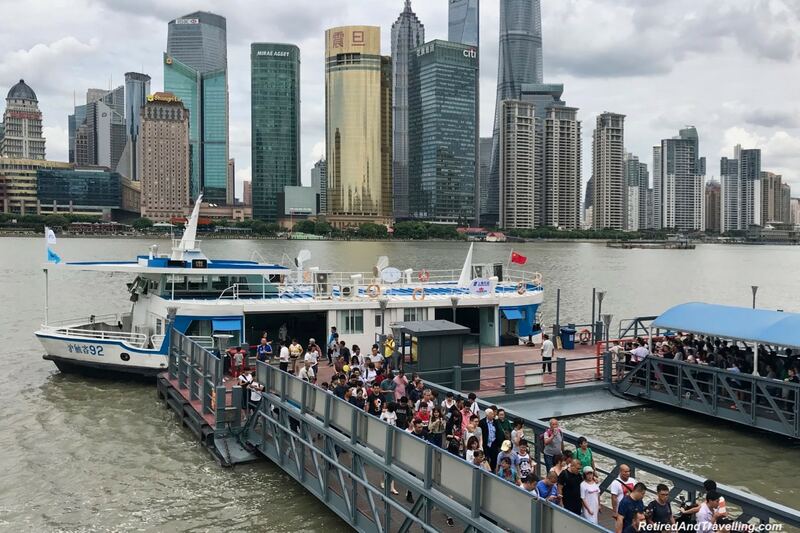 Broad walkways at street level and above provided lots of space for people to experience the Bund River area in Shanghai. There were spots to grab food and drink. Photo booths helped create souvenir moments. And there were even public washrooms! We saw the Pearl tv tower across the busy river. Beside the Pearl we saw a number of other high buildings in this new financial district of Shanghai. 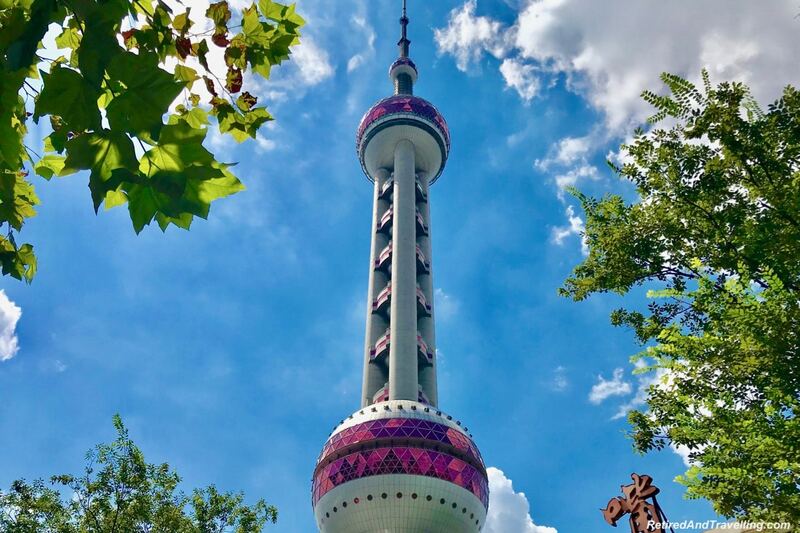 The tallest tower in Shanghai (and the second tallest in the world after the Burj Khalifa in Dubai) was the Shanghai Tower with its distinctive twisted tapered cylindrical shape. 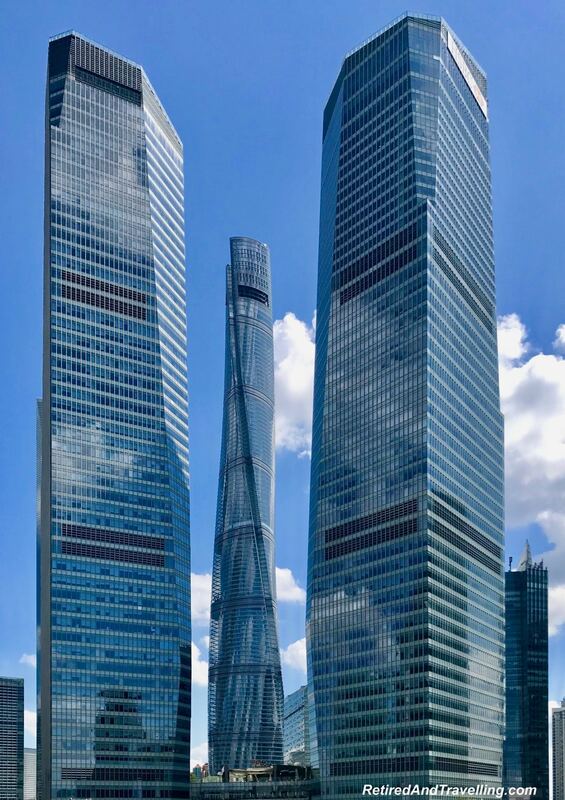 When we visited Wuhan to start our cruise down the Yangtze River, we saw a new building under construction that will be even taller than the Shanghai Tower. It reminded us very much of the building competitions we saw in Dubai. The river was a busy spot. Ferries and cruise boats went past on a regular basis. But so did very large barges full of cargo. It was easy to see this was still an active and busy port city. Shanghai certainly held its own in terms of architecture. 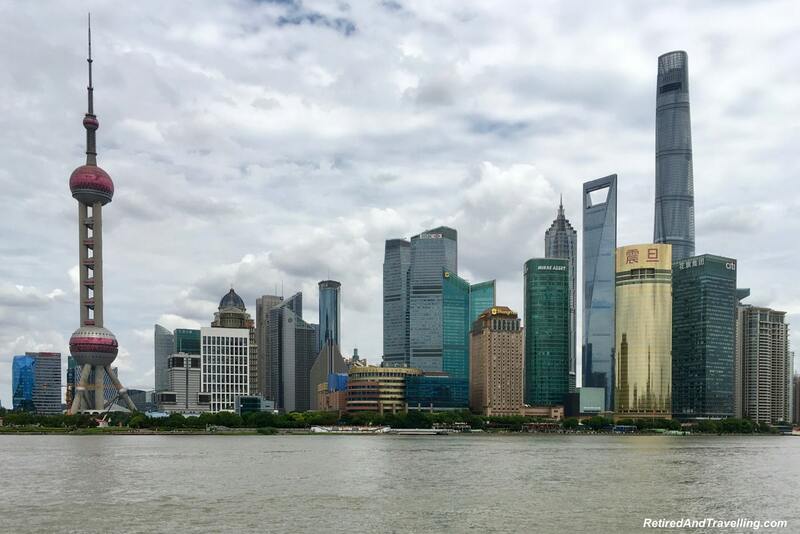 Our first visit to experience the Bund River area in Shanghai just left us wanting more. On a bright and sunny day, we ventured over to the far shore and saw the high financial towers up close. The Pearl sparkled high above us. The towers reached up in the sky. We walked along the elevated sidewalk to catch these beautiful buildings from all sides. There was so much to do in the area when we crossed the river. The Disney store drew in the kids. High end brand stores tempted the shoppers. And the aquarium is there if you get a bad weather day. 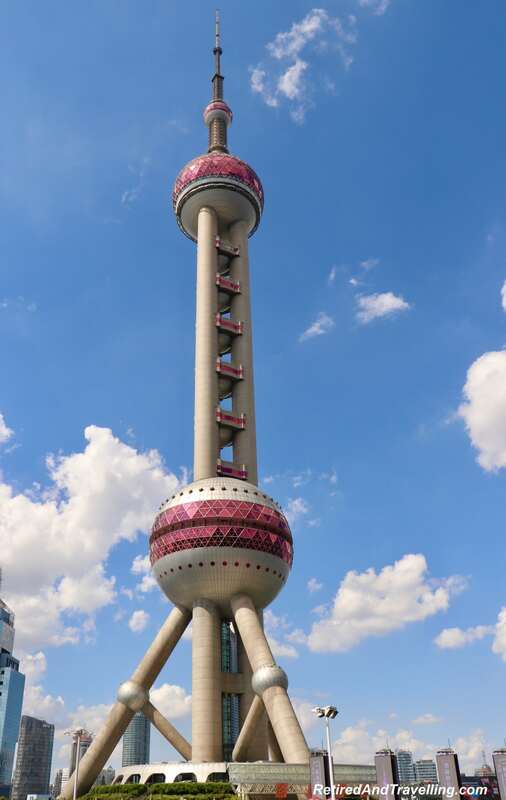 We debated whether to go up to the observation levels in the Pearl or the Shanghai Tower. Unfortunately we passed on heading up for a panoramic view on that day. And then we lost the clear skies. 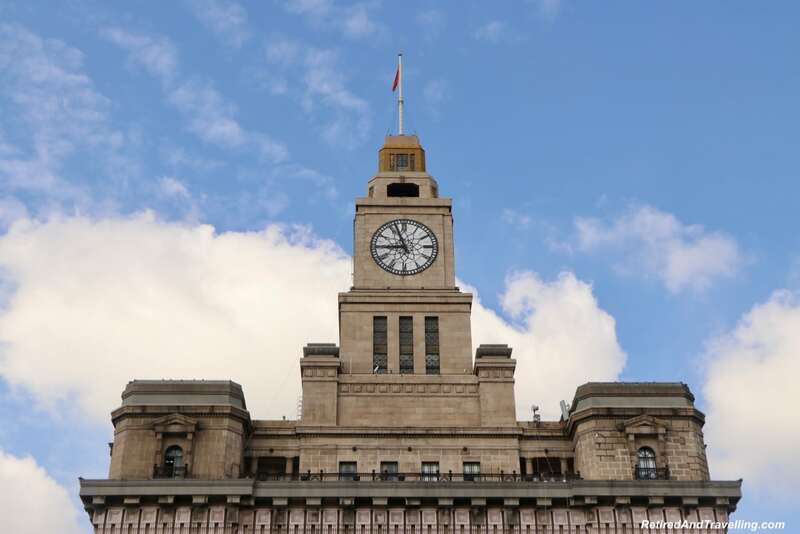 Don’t miss a change to experience the Bund River area in Shanghai when the sun is shining bright. If the view during the day was interesting, it was quite magical at night. We got our first glimpse of the night light display from our hotel room. But a short walk to the Bund let us see this in all its glory. 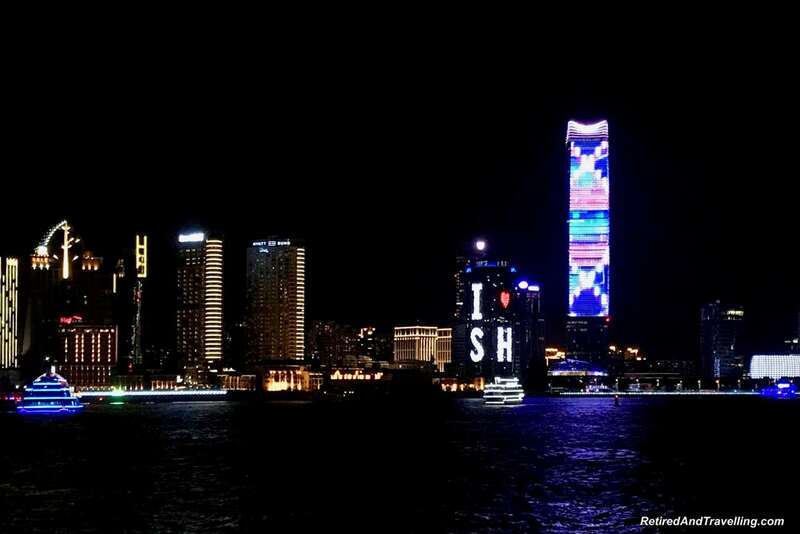 All of the towers along the Bund were lit up. And the light show changed continually. River boats lit with neon streamed past on a regular basis. We had considered doing a night river cruise. But the view from the shore close to our hotel gave us all we could want for a nighttime view. 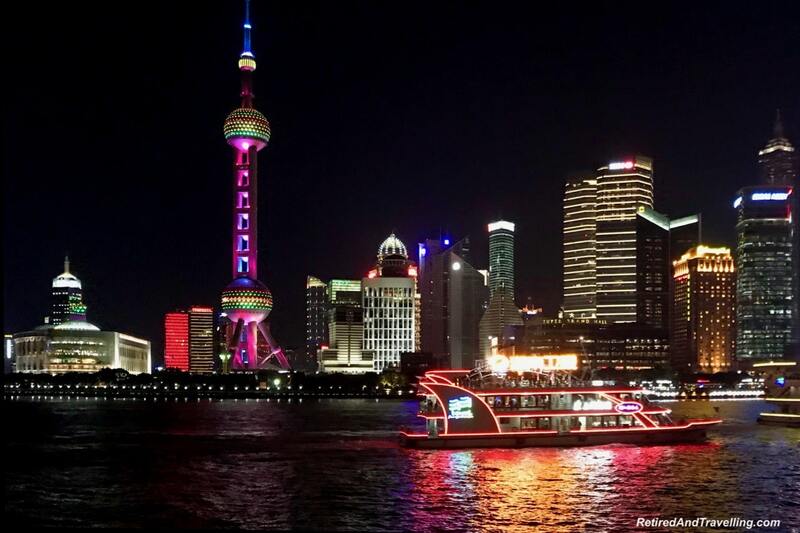 Experience the Bund River area in Shanghai at night for a stunning show. This was just the first of the many night light shows we saw when we visited China for 4 weeks. 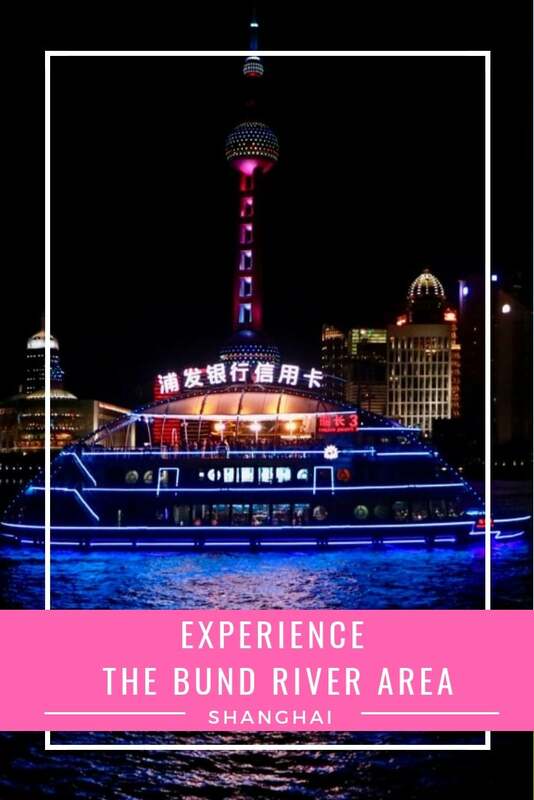 When we cruised the Yangtze River, we got stunning night light shows for our departure from Wuhan, at the Three River Gorges Dam and again when we passed the bridge in Yunjang. 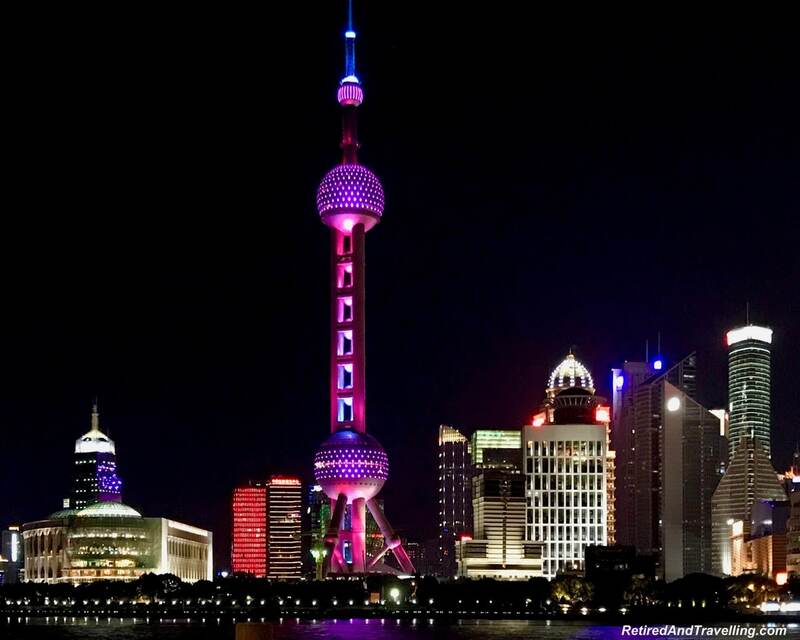 We would come to think of China as the country of night light magic! 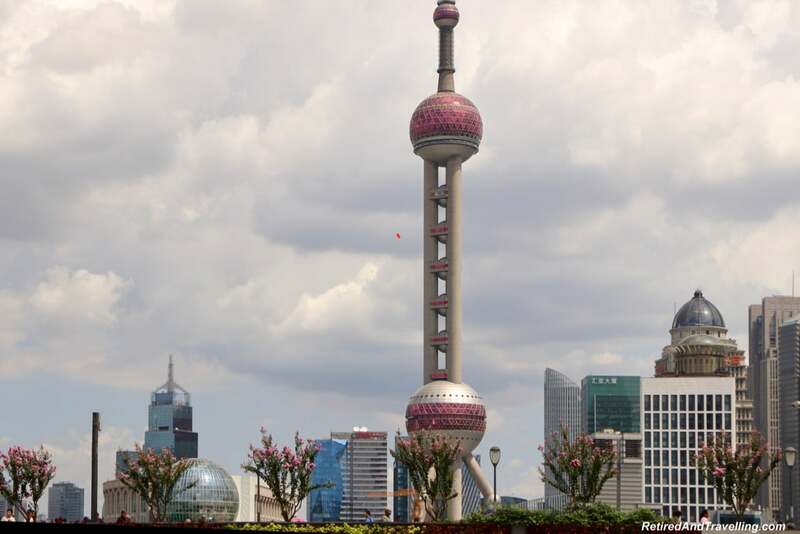 On our visit to Shanghai for a week, we went down to the Bund several times. Day and night views gave you a very different perspective on the city. At day it was a shining metropolitan area. At night the buildings took on a playful charm. 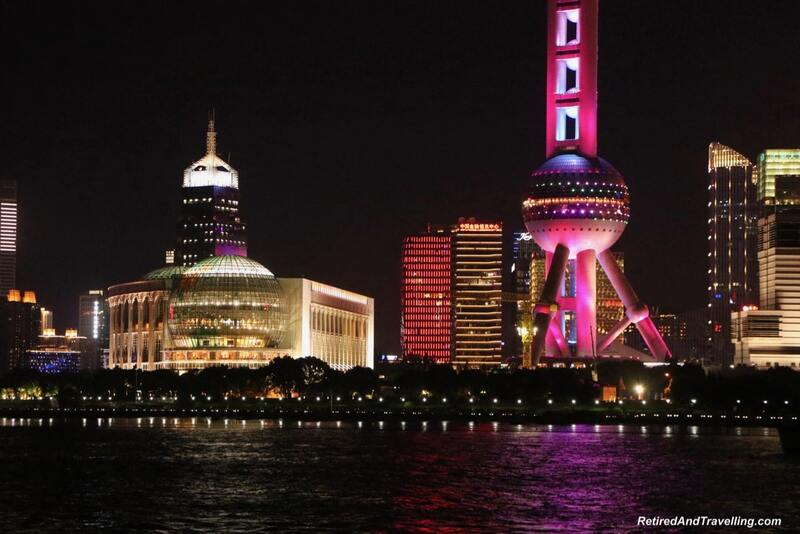 But no matter when you visit, plan to experience the Bund River area in Shanghai. 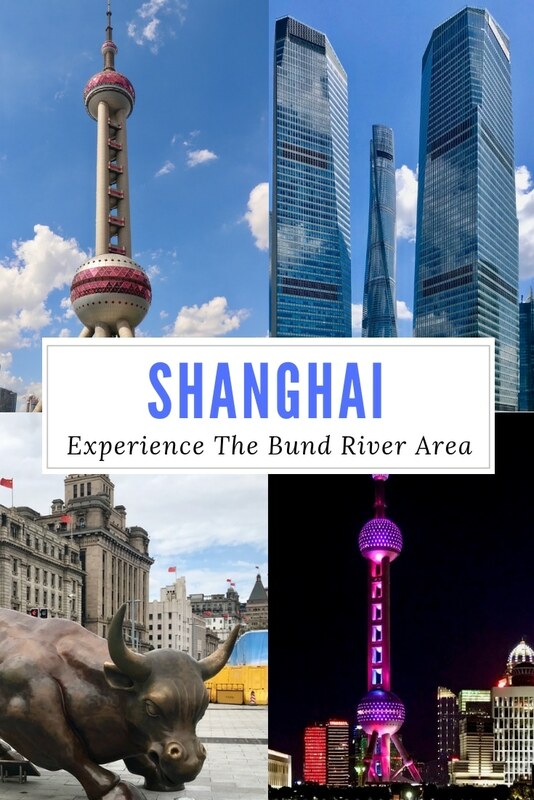 Did you experience the Bund River area in Shanghai? Did you take in the night light show too? Once again, fantastic photos. We will have some free time in Shanghai on our ATW trip. After seeing your blog, we plan to pass on the formal city tours and go it on our own. Any advice on eating, crossing the river etc? Bund River looks amazing and vibrant! Whilst I would’ve loved going up the Pearl or Shanghai towers, my hubby hates heights so perhaps the view from below would suit us better! 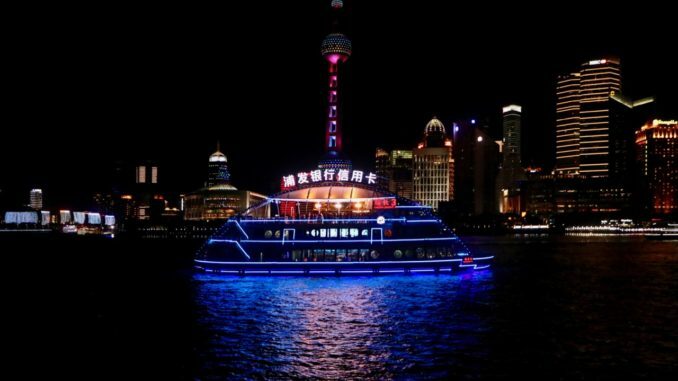 I love your night shots – such amazing lights on the Bund River! Lovely photos. 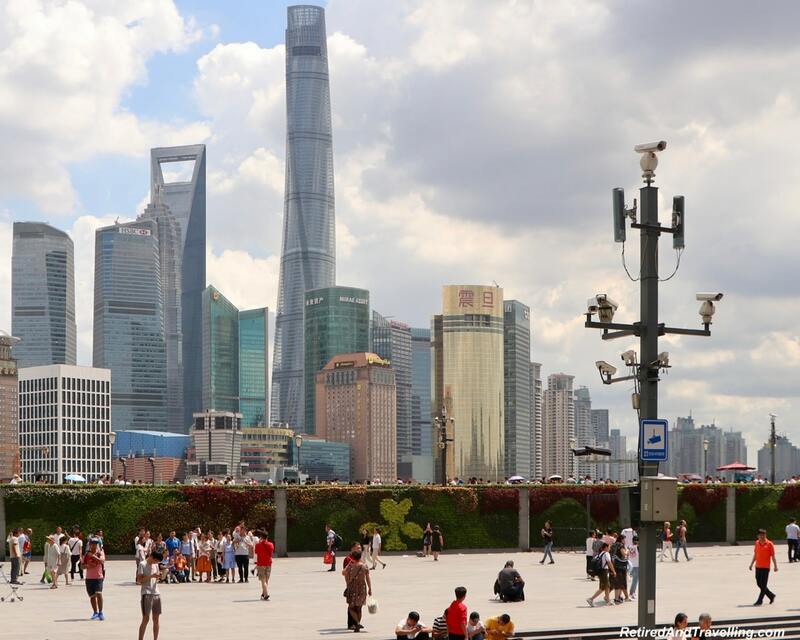 When we lived in China, our sponsor/client set up a week long tour for us to Shanghai. Unfortunately, we only had about 18 hours in Shanghai. The rest was spent in small towns around Shanghai. They were lovely towns and honestly, probably more my speed. I would have liked a little more time in Shanghai. We did make it to this same area though. Definitely a wonderful place to visit again and again. The night lighting enhances the overall experience. How wonderful to see this area in day and by night. The waterfront would draw me in too for the best views and photos. 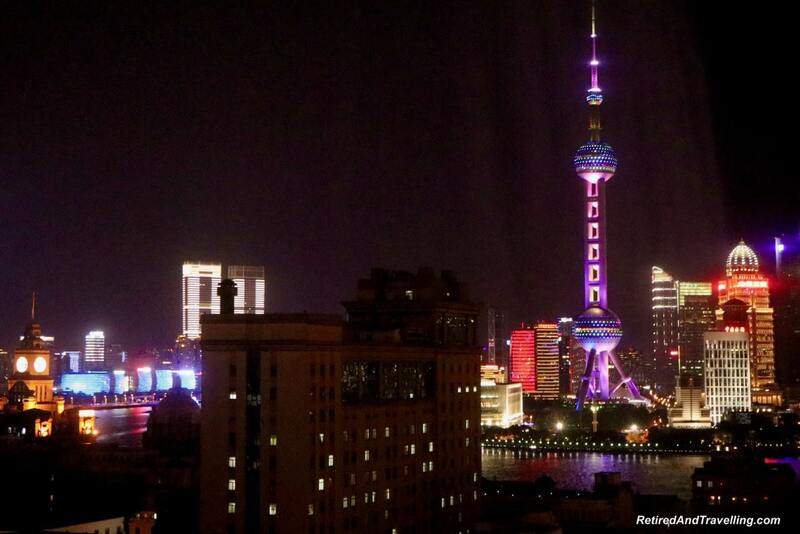 I love the towers and lights of Shanghai. I was surprised by how few people there were. I would have expected everything to be wall to wall people in Shanghai. 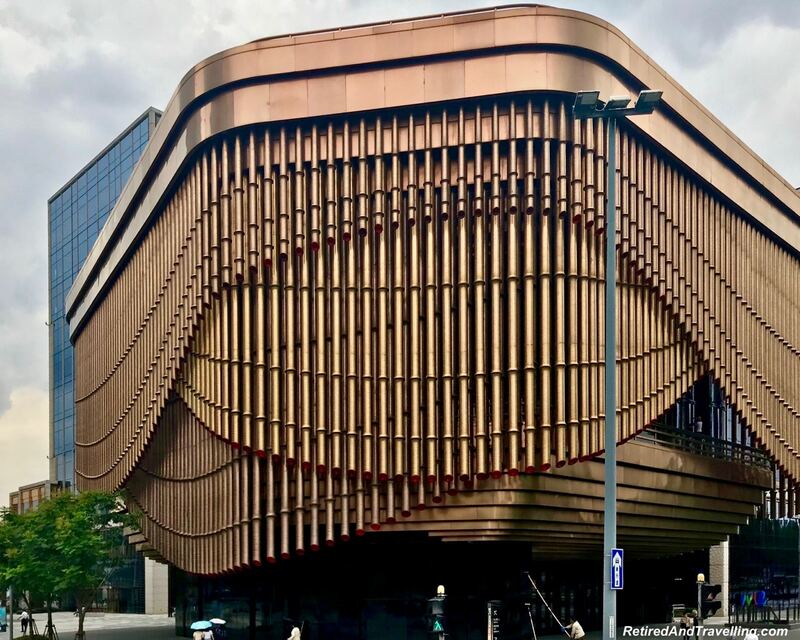 Such beautiful architecture in Shanghai! And that view from the shore close to your hotel room is just magical 😍😍 – love all the lights! Looked like an incredible experience! Shanghai China looks like a futuristic city. Skycrappers here and there and the magical view at night is truly stunning. My partner travels to Shanghai sometime in a year for business and he sends me some similar photos of Shanghai. I hope next time I can go here too with him! China has many surprises! Wow… these replicas are pretty realistic! If you had just given the photographs, nobody would have figured out. The tower looks very unique though. I had no idea how much beautiful architecture was out there. It’s unbelievable, it looks like a mixture of so many different cities from the world all wrapped into one. I couldn’t help but think aside from advertisements it looks like NYC and Seattle combined.